I did something this morning that I've never done previously while on vacation before - worked out at a gym (the hotel gym, to be clear). After the workout and a shower, I packed up and checked out of the hotel at noon. I dropped my bags off then walked down the street to Gokul Vegetarian Restaurant for some Indian food. My overall impression of the place is that it's a basic joint with basic food - my Palak Paneer was not terrible, but nothing to write home about either. One thing to note - I used up the last of my cash there, as they (like most of the restaurants in that building, except for Herbivore, interestingly) only accepted cash; no complaints, though, as I needed a way to get rid of my cash anyway. Shots & Scoops was cash-only as well, so it seems to be a pretty common thing in Singapore (which I wouldn't have guessed prior to the trip). 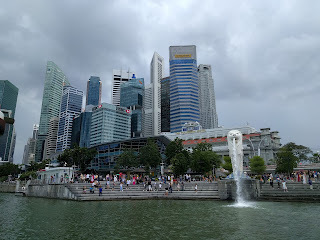 I had a couple of hours to kill before I needed to head to the airport, so I decided to go on the river cruise that I had abandoned the night before. I took the MRT (the North East line this time) from Dhoby Ghaut (NE6) to Clarke Quay (NE5), then found the Singapore River Cruise booth. A light drizzle had begun by this point, and it was on and off for the next hour or so. The river cruise took about 40 minutes, dropping us off around 2pm. 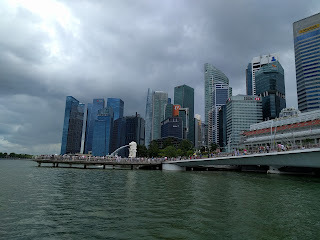 The route took us down the river to Marina Bay and back, and provided some pretty great views of the city. After the cruise I retraced my path back to the hotel, where I redeemed my drink coupon (which was provided at check-in) to cool off for a minute and then picked up my bags. I walked over to the Bugis station (EW12) and then took the East West line to the Changi line to Changi airport - this required a change at Tanah Merah, EW4, where the Changi line spurs off. I was a little hungry after checking in and going through the document check (note: this is one of those airports where the final security check happens at the gate entrance, so there are no amenities after that final security check), so I found a food court to get a little bite - a Kaya (jam) Butter Toast sandwich and fruit punch from Killiney Kopitiam (a local coffee shop chain). The JetStar A320 rivaled that of Scoot Airlines in terms of minimizing knee room, so I was happy to have an even shorter flight this time around - it departed 15-20 minutes later than the scheduled 5:55pm, and took just over an hour. 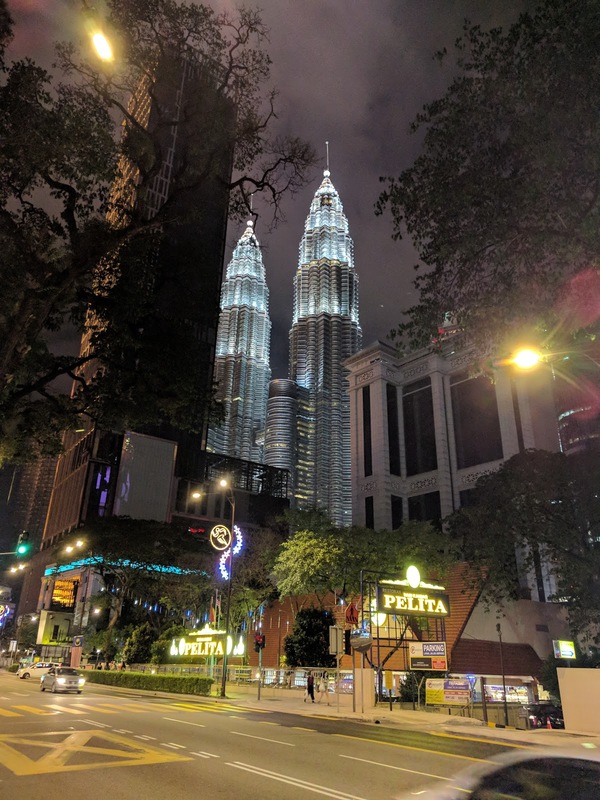 After doing all the international arrival things in Kuala Lumpur (Malaysia does passport scan, photo, and index fingerprints upon entry, but apparently not a customs declaration form), I took the KLIA Transit train into town (contrast with the more expensive but faster KLIA Express train; I didn't know that they were separate things until after I already bought the ticket). At KL Sentral I bought a Touch 'n Go card (one of those transit cards that you can refill, just like I had used in Singapore; also, the transit office only accepted cash, so I had to make an ATM withdrawal first) and then took the Kelana Jaya line (5) to Dang Wangi (KJ12). From there I walked to the Hotel Maya and checked in. I was hungry again after getting up to my room on the 16th floor, but I didn't want to go back out to get food; plus it was after 10pm. So I made another travel first and ordered room service (technically only for the first time that *I* did the ordering) - a vegetable cheese sandwich (with fries) and a pineapple juice.